According to a recent survey conducted by the US Bureau of Labor Statistics, the mean annual pay of a certified nursing assistant in the state of North Carolina was $22,860 and per hour salary was $10.99 in May 2013. NC employed 50,990 nurse aides in the same year and employment per 1000 jobs was 12.92. 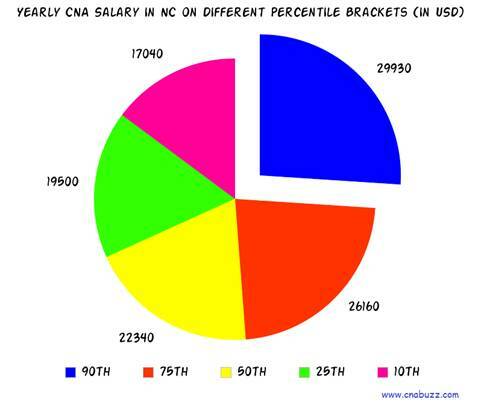 The figures in indeed.com indicate that the average salary of a CNA was $23,000 as of Jan 2015. It was 5% lower than the average income for job postings throughout the nation. Nurse aides selected at entry level receive a decent starting pay. 90% of CNAs made less than $29,930; 10% made more than $29,930. 75% earned less than $26,160; remaining 25% earned more than $26,160. 50% of the employees waged less than $22,340; rest 50% were salaried more than $22,340. 25% of CNAs were paid annual wages less than $19,500; 75% were paid more than $19,500. 10% of employees were offered less than $17,040; 90% were offered more than $17,040. Before beginning job hunt in North Carolina, have a glance at the table below to know the best paying cities in the state. As per the figures provided by salary.com, Charlotte, Concord and Gastonia were the top paying cities with median annual salary of $30,667 and median monthly salary $2,556. Greenville paid the lowest median annual salary of $26,534 and median monthly salary $2,211. A certified nursing assistant performs duties according to their respective designation. The information on indeed.com shows that CNA Hospice made more money, i.e. $30,000 as compared to other job titles of the state. The lowest paid professionals were Correctional Prison Facility CNA who got $14,000. The various benefits offered to the nursing assistants provide them financial security. The job opportunities of certified nursing assistants will rise by 21% in the near future, which will create 312,200 new positions by the year 2022. The only hindrance that might limit this growth is the dependence of nursing homes on the government funding. Nonetheless, shifts in federal, state funding and patient preferences may result into improved chances for CNAs employed in community rehabilitation services. Question 1 – What average hourly rate a CNA can expect in the state? Answer – The hourly rate in all the cities of NC ranges from $13 to $15. Question 2 – Which is the highest paying city in the state and what maximum salary can we expect there? Answer – Charlotte, Concord and Gastonia are the top paying cities with median annual salary $30,667 and median monthly salary $2,556.